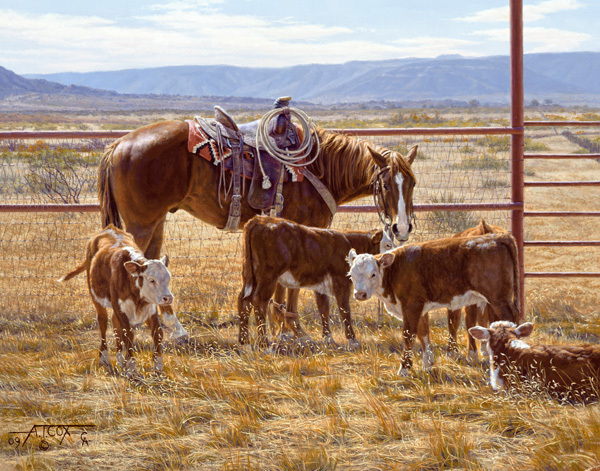 Tim Cox lives the cowboy life he paints whether it's rounding up a herd, branding or any of the other daily chores that are part of ranching life . Out on the range, the horses and the cattle spend a lot of time together. Cox has created an image of a working horse and three of his little friends enjoying each other's company. A fourth calf seems a little shy and is "Reluctant Company." Perhaps the group will convince the calf to join in and the party will be complete.